How to use Facebook Groups and Increase Your Email ListsteemCreated with Sketch. In this article, I am sharing a small part of your strategic planning to grow your Business. I am not fun of exposing my personal life to social media, but some make millions. Celebrity and reality cultures are increasingly helping us understand that we need to Facebook a bit! Don’t you think? I am writing a Content Marketing strategy for Facebook that works! First, you will need to check and analyse your Business groups within your niche. Is a part of your Business developing strategy, searching for your market segmentation and you can read a previous article about segmentation here. Is very important that you understand the main issues your clients are facing right now. Because the world is changing tech is developing rapidly, and all of we have our Business issues. Also, you may need to improve your customer’s services as well. Join Facebook groups will help you identify your consumers wants and needs. Attracting new clients and generating new leads, learning about market growth is always an essential factor. The Business you are in you may have to ask and engage with customers. It is crucial that by participating in forums learning about wants and needs. It will help you increase consumer’s satisfaction. Marketing research is your key to success for your Business. Then keep in mind that you are not spending any money on marketing research. Using Facebook Business groups, you can find out how the customers buy and what competitors are offering. You can apply to narrow down your focus and increase Brand awareness. The practical way to add value and raise awareness of your Business inside those groups is to offer advice. Based on your Business needs and Brand recognition that you want to get, you will have to join the relevant groups. They are a lot of Business Facebook groups so you can join the ones who are for business owners and having over 1000 active members. You may join groups which are relevant to Business growth or creative PR and much more. The idea of the Forums and discussions at those groups it will mainly help your focus into your Brand. You can focus on needs and great opportunities that may arise through. Do not forget that you are gaining a competitive advantage. A group about consumers focus while you are developing new products and services it will be great! Learning and providing problem-solving ideas in those groups positioning you as an expert. They are three different types of groups, close, open and secret. The open group if you need to build up yourself as a specialist and to connect with others in your industry. The principal centre that you ought to do around open discussion isn’t offering but instead support and connections. Close Group is best for client’s innovations purpose. For instance, we are utilising a closed group for one of my customers’ present clients who need to impart thoughts to different clients. We likewise employ this for client support and problem-solving. Secrets group’s individuals are fantastic for more massive amount exchanges that need secrecy. For instance, since I oversee heaps of groups, organisations. We utilise mystery bunches for coordinated effort and take after ups. Other organisations locate the mystery gather helpful as one approach to connecting with their customers or clients particularly for those on coaching and counselling business. Also, you can join networking groups for females or male Entrepreneurs’. Find out the latest events and conferences that operating in your country. Using Business Facebook groups, you can be a focus on customer’s issues and try to increase your credibility. Increase your Brand awareness that you can solve problems. Give your business the forums can obtain the benefits. Learn what buyers are willing to buy or pay. Add value and more benefits to your expertise to increase customers’ satisfaction. The one thing that groups are fantastic for if you are thinking about product development. Increase your Brand awareness by creating a differential advantage. Throughout the groups, you can create value for your clients by offering services and products relating to your consumer needs. Also, by participating in the discussion’s you are learning what products and prices your clients are willing to pay. By positioning your Business as an expert, you will be able to increase your client database. People will reach out to you and subscribe to your services. You will see a massive difference in your revenues while you are building a relationship. Remember introducing your Brand correctly you will gain a lot of sales. Business Facebook groups are compelling that change existing brands. Also, it will give essential eyesight at Business updates! It will help you network with others entrepreneurs, learning what your competitors are up too. 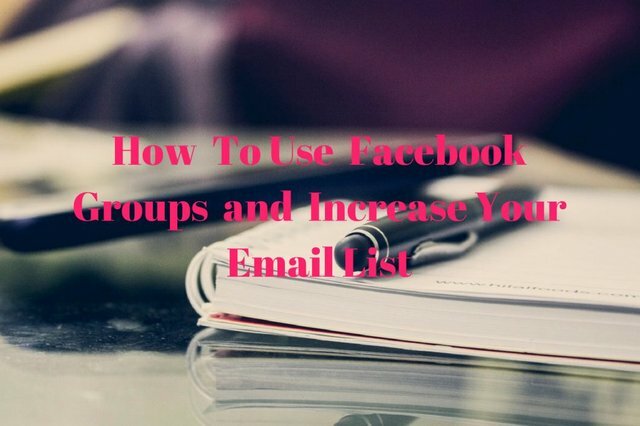 Increasing your client base is the best resources from Facebook groups. Clients learning you’re Brand and your products and services, and they value your direction. Focussing your attention on opportunities and enhancing the group experiences. As restrict to continually endeavouring to discover new clients. It can be an excellent method to supercharge incomes for your business. The practical way to increase your email list and create a database of clients. That is my successful strategy of expanding my leads base with relevant clients. Influencer marketing is rapidly popular and isn’t leaving the content marketing at any point shortly. The tactic that will separate you from different brands will locate the privilege influencer and collaborate that gets your target markets consideration. That is a strategy that I use to increase my email list and much more. The most effective way to make your second offer after your clients have subscribed to your email list. Facebook is marketing and some other internet based life promoting efforts for all things considered. You ought to do it well ordered until the point that you assemble the Business relationship you wished to have. There ought to be more Facebook advertising thoughts out there, yet I guarantee you that the above strategies will give your Facebook business a significant lift.